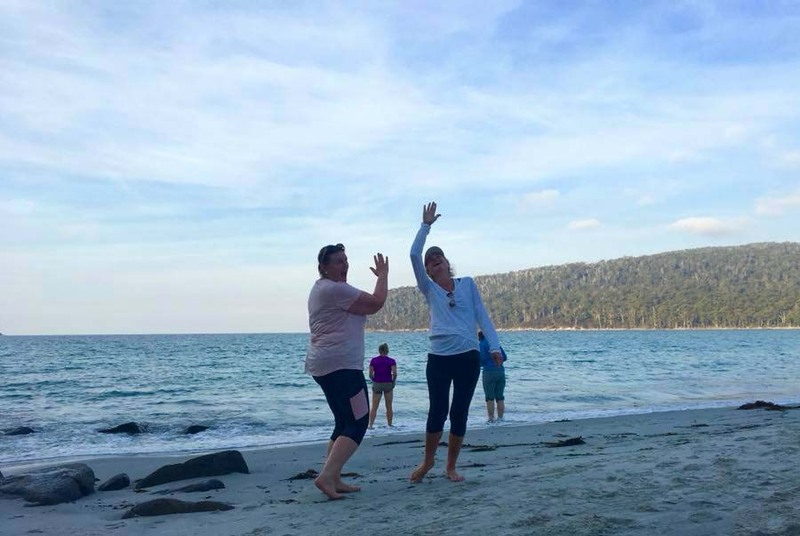 This 3 day walk has been designed for those looking for a Pack Free walking experience of the Three Capes and Tasman Peninsula without the burden of carrying your clothes, food and a heavy pack. Our Three Capes guided Pack-Free walking tour explores the natural beauty of the Tasman Peninsula in the far south-east corner of Tasmania, a region famous for its three spectacular capes which comprise of the highest vertical seas cliffs in Australia and a dramatic coastline of sea caves and towering sea stacks. 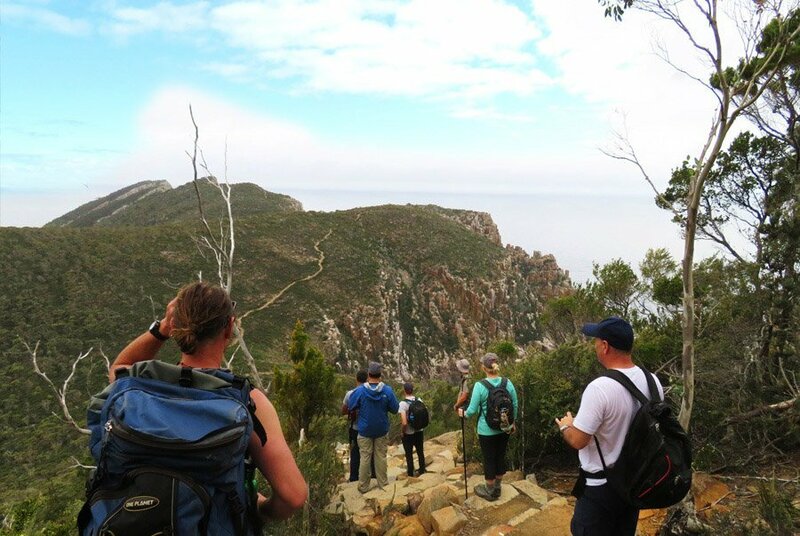 On this 3 day experience we walk to the first cape, the spectacular and must-do ‘Cape Raoul’ with its dramatic cliffs. 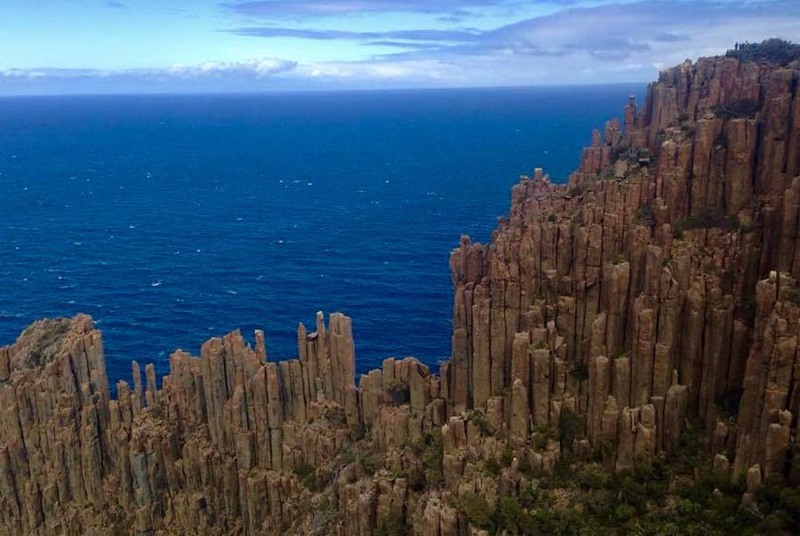 We walk to stunning ‘Cape Hauy’ and view the famous ‘Candlestick’ and ”Totem Pole’ sea stacks. As well as wandering through gorgeous rainforest tracks between Waterfall and Fortescue Bays to take in breathtaking coastal views. 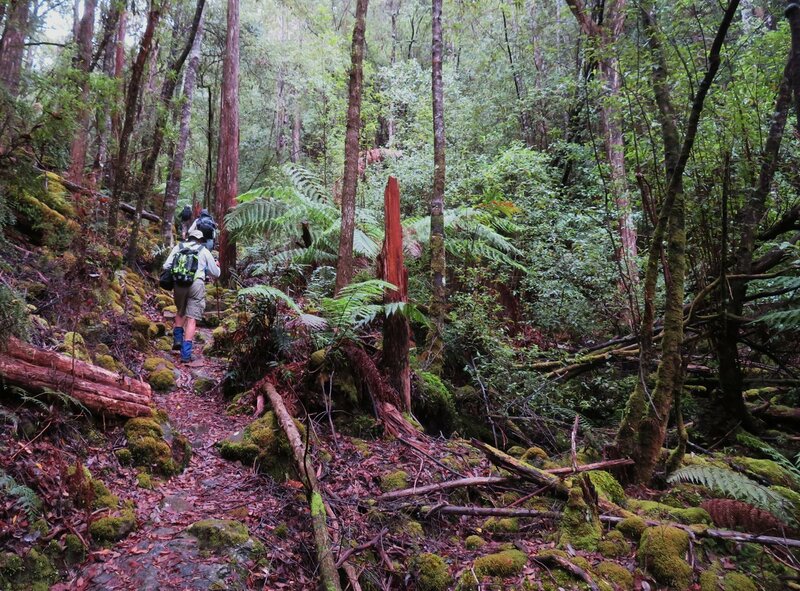 Explore the untouched wonders of the Tasman National Park as we venture along one of the great walks of Australia, experiencing varied landscapes of coastal heathlands and eucalypt forests. 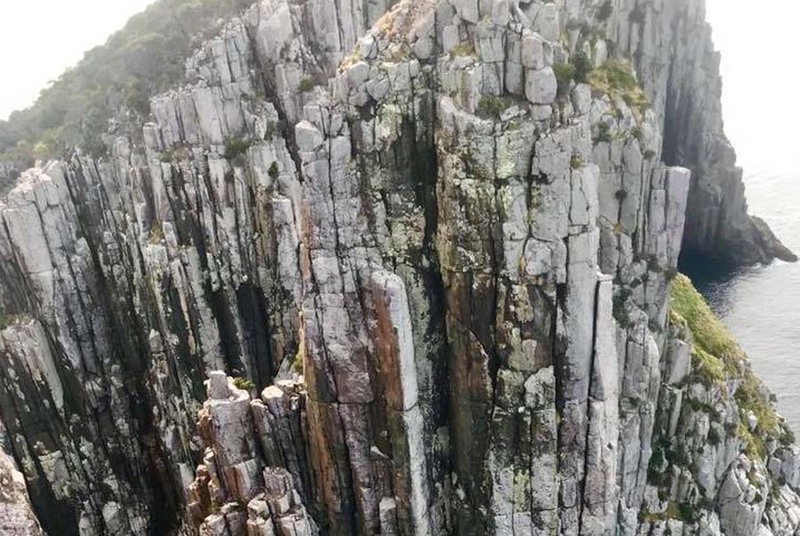 We finish our journey with an unforgettable helicopter flight over Cape Pillar and Tasman Island, or you could choose an exciting wilderness cruise around the base of Cape Pillar for a unique view of the Cape. 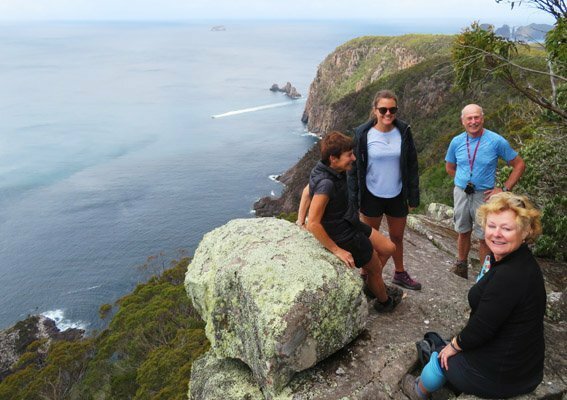 Discover the Three Capes of Cape Raoul and Cape Hauy by foot and finish your journey with your choice of a helicopter ride across Cape Pillar and Tasman Island or a dramatic wilderness cruise around Cape Pillar for a unique view of the peninsula from the base of the cliffs. 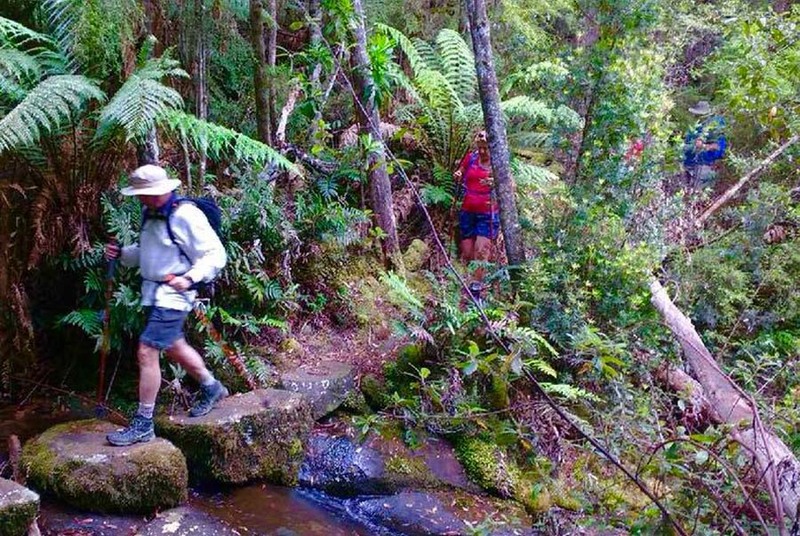 You’ll also walk from Waterfall to Fortescue Bay which is nothing short of amazing, featuring sections of stunning rainforest found no where else in the Tasman National Park. One of the biggest draw cards of this walk, is that our guests won’t be asked to carry their clothes, food or overnight bags for the entire walk. This is a big advantage in that you will avoid carrying an additional 8kg or more on your back. With Life’s An Adventure you will carry as little as your water bottle, lunch and camera each day. Our guests will love everything about Stewart Bay Lodge, our accommodation for 2 nights during our walk. From the decor of the main lounge and restaurant, to your modern and stylish Deluxe Spa Chalets, this place has it all. Each modern chalet has 2 bedrooms and 2 bathrooms plus lounge room. We carefully design our walking tours to add a “Wow” Factor to every walk, allowing our guests access to remote areas not usually reachable in day. 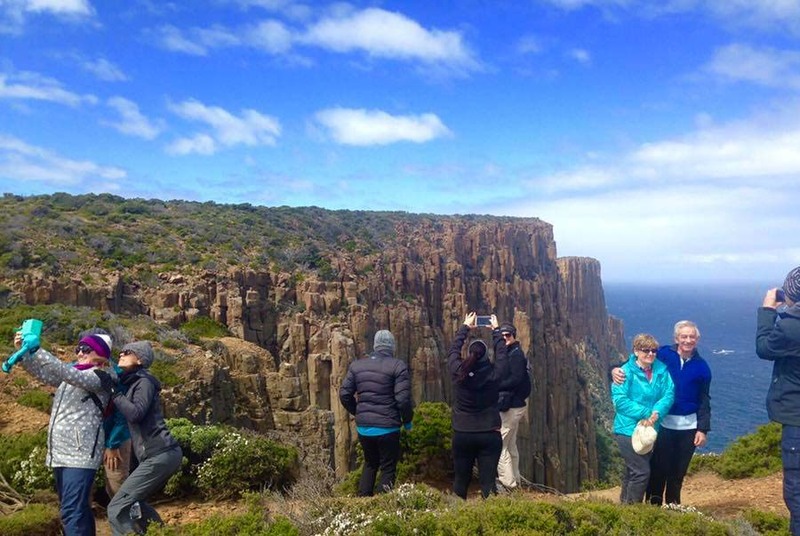 On this walk, guests will have the choice of a spectacular helicopter ride where you can marvel at the dramatic cliffs of Cape Pillar and see remote Tasman Island and it’s exposed lighthouse, or join a wilderness cruise around Cape Pillar to see the spectacular sea cliffs from water level – a great way to appreciate the magnitude of these giant cliffs. There is no better way to see this spectacular region. Meal time is a special time on tour. Not only does it provide the opportunity to get to know your fellow travellers in a relaxed environment, it also allows you to sample regional specialities. On tour we have two highlight dinners one at the fabulous 1830s Restaurant overlooking Port Arthur Historic Site and the second at Gabriel’s Restaurant at Stewart Bay Lodge. 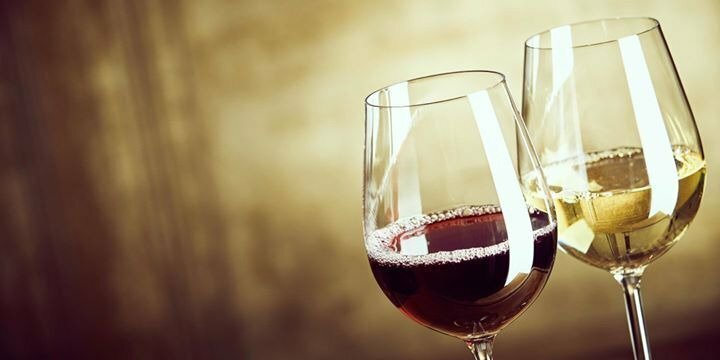 Enjoy fine dining served with beautiful Tasmanian wine with an emphasis on local produce and modern cuisine. Note: if restaurant is closed a local restaurant will be substituted. As we have two guides on this walk we are able to offer both easier and harder walking options for our guests catering for a range of abilities and fitness levels. (Second guide on this tour is subject to a total group of 8 or more). Our guides are proudly 100% Tasmanian. We call them our CEOs – Chief Experience Officers and it’s their job to ensure your tour exceeds your expectations. Our chief guide Jef has grown up walking the trails of Tasmania. His caring attitude and his amazing story-telling ability will make your tour a relaxing, fun and informative experience. When you travel on one of our walking tours, you won’t be asked to put your hand in your pocket for extras along the way. All restaurant meals featuring local produce as well as Tasmania wine are included in your walking tour with nothing more to pay. You won’t even be charged extra for credit card fees. Our walk is not the Three Capes Track self guided walk run by Tasmania Parks and Wildlife Service. For information for this walk call 1300 827 727. No Credit card fees to pay! Main walking itinerary: The Hotel Grand Chancellor in Hobart will be our starting point for this Three Capes Pack Free walk. We depart at 7.30am and travel out to Tasman National Park. (Alternatively you can organise to meet us at our Stewart Bay Lodge, Port Arthur). 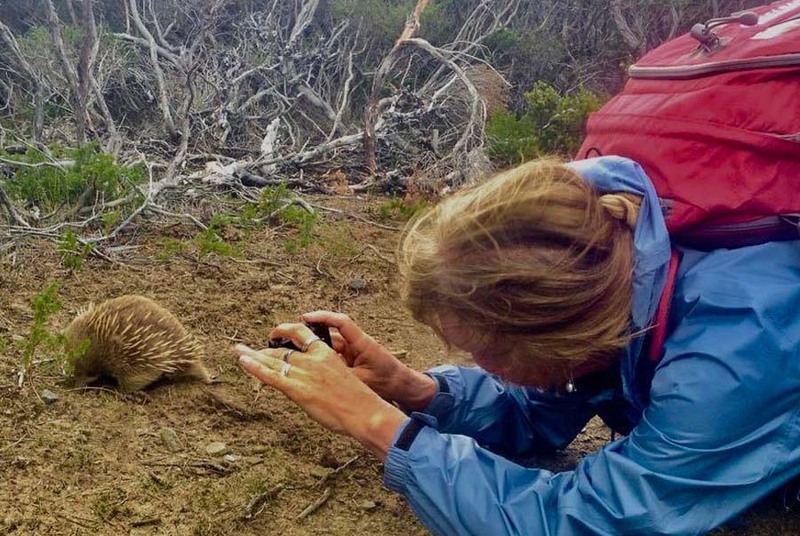 This geographically isolated peninsula, has over one third of Tasmania’s recorded plant species including more than 60 that are threatened species. 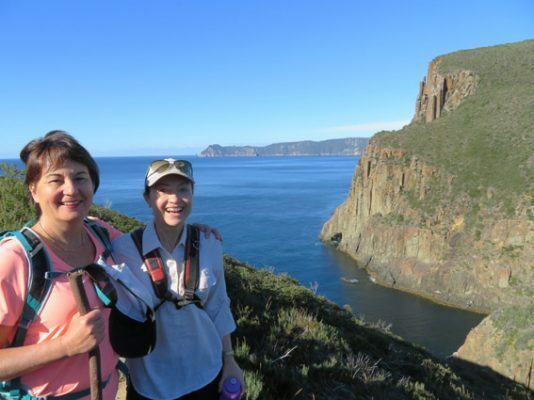 We walk through eucalypt forest, past flowing streams and over log bridges..
We continue on through rough uphill sections to Cape Raoul with its towering cliffs and see excellent views of Tasman Island, Bruny Island and the southern Capes. On the plateau you’ll wander through beautiful banksia scrub and from the edge of the Cape you may even see the seal colony nestled at the base of Cape Raoul. After our walk we head to Stewarts Bay Lodge for the next two night’s accommodation where we stay in two bedroom Deluxe Spa Chalets. Tonight dine at the superb 1830s Restaurant featuring local produce and wine. This superb restaurant overlooks the historic Port Arthur Site offering stunning views of the dramatic lit up buildings whilst dining. A great way to end our day. Easier walking itinerary option: As we have two guides accompanying this tour, we offer an easier option for today’s walk. 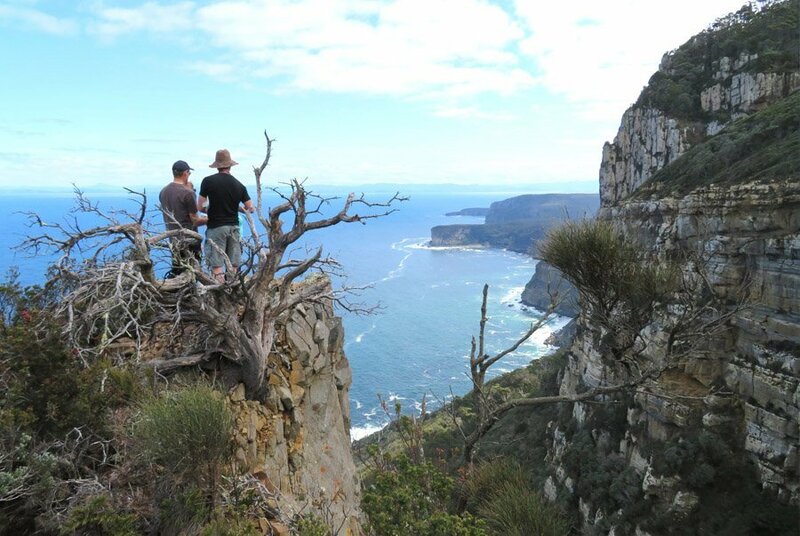 Travel with the group until you reach the Cape Raoul lookout so you can enjoy spectacular views. Retrace your steps and then our guide will then take you back early to your accommodation. Note: When there is 8 or more passengers on tour, we have two guides offering a choice of two walking options – our main walk and an easier walking option. Tours with 7 or less people will only have 1 guide and therefore the easier option will not be available. Please feel free to check with our office when booking. MAIN WALK GRADE: 17.5km. First 2 hours ascent through rainforest then a descent for next 1.5 hours. Then track undulates. Last 5 km around bays with a series of hills. Good level of fitness required. 9 hours walking with breaks. Main walking itinerary: After a hot breakfast we head to picturesque Waterfall Bay to see some of the peninsulas most impressive geological features – this walk is nothing short of amazing. We begin our walk at Waterfall Bay where we immediately see a 200 metre waterfall plunge into the sea. We start with a gentle climb through stringybark forest. From here we enter a rainforest area, for the next 45 minutes we climb 548 metres to Tatnels Hill, the highest point of this track. From here the climbing subsides and the trail gently winds downhill for quite some time. The frequent coastal views of dramatic towering sea cliffs never fails to impress. 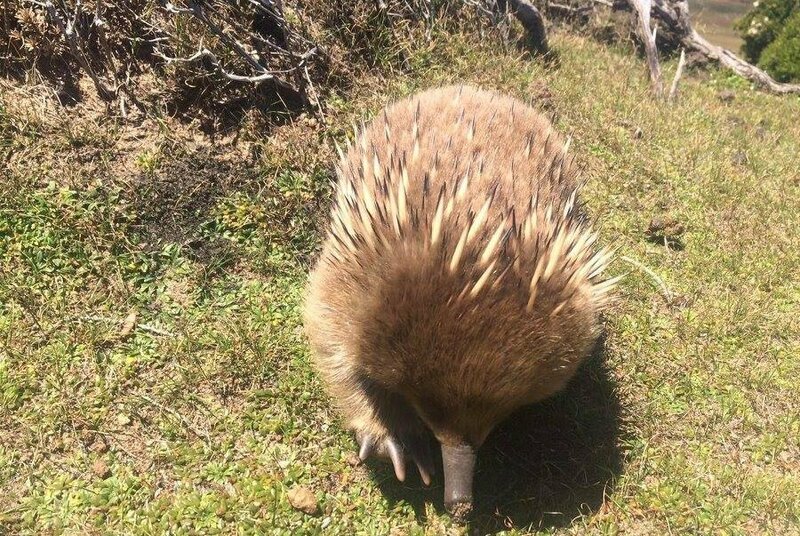 A variety of habitats provide a great diversity of wildlife that live within the National Park, from possum, Tasmanian bettong and long nosed potoroo to eastern quoll and wombats. A colony of little penguins also call Fortescue Bay their home, which can sometimes been seen at dusk returning to their burrows. Afterwards we return to Stewarts Bay Lodge for dinner in the superb Gabriels Restaurant overlooking the bay featuring wonderful Tasmanian wine with a modern Australia menu with a focus on local produce. Easier walking itinerary option: As we have two guides accompanying this tour, we offer an easier option for today’s walk. Those who chose this walk will start the day with a rainforest walk with the rest of the group. We then head to Waterfall Bluff for morning tea before exploring Devil’s Arch and Remarkable Cave. We head back to Stewart Bay Lodge. 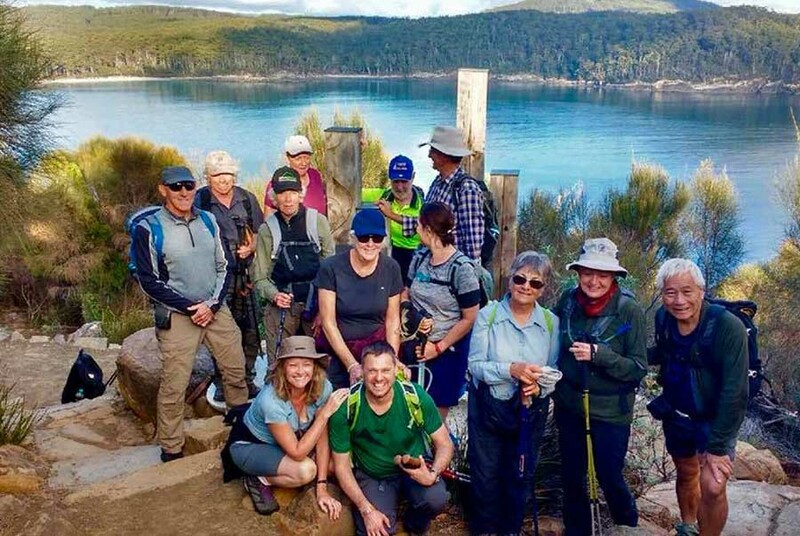 This afternoon is free to explore Port Arthur Historic Site or guests can enjoy a walk at Fortescue Bay to meet up with the rest of the group. Cape Pillar Helicopter or Cruise. Cape Hauy walk. EASIER OPTION: 6kms. Shorter version of same walk. Moderate level of fitness required. 4 hours walking with breaks. Itinerary: This morning we have a relaxed hot breakfast and give our legs a break before our afternoon walk. Choose from seeing Cape Pillar by either helicopter or cruise. For those who join the helicopter experience, you have 1.5 to 2 hours free time in the morning to relax or visit Port Arthur Historic Site or alternatively our guides will take you to see Remakable Cave. 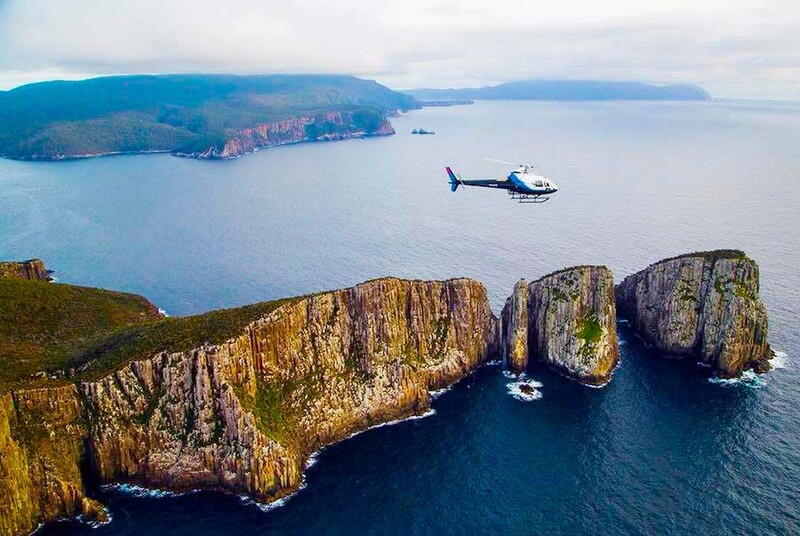 The highlight of our day is our helicopter flight which will takes us for a bird’s eye view offering magnificent vistas as we fly over the towering sea cliffs of Cape Pillar and out to remote Tasman Island with its’s exposed lighthouse. Subject to minimum numbers of 4 guests. Afterwards we cross the road to the Lavendar Farm where you will enjoy a sit down lunch and time to wander amongst the lavender fields. 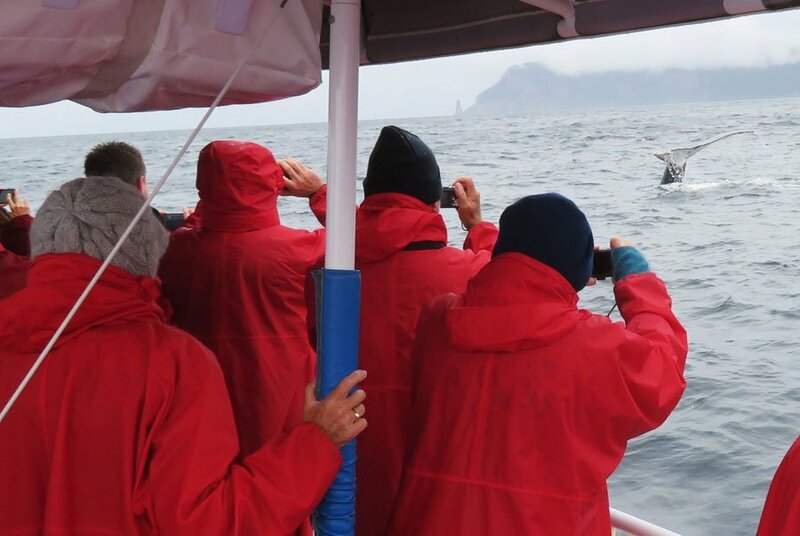 Alternatively guests can enjoy a three hour wilderness cruise around Cape Pillar jutting impressively out to sea. 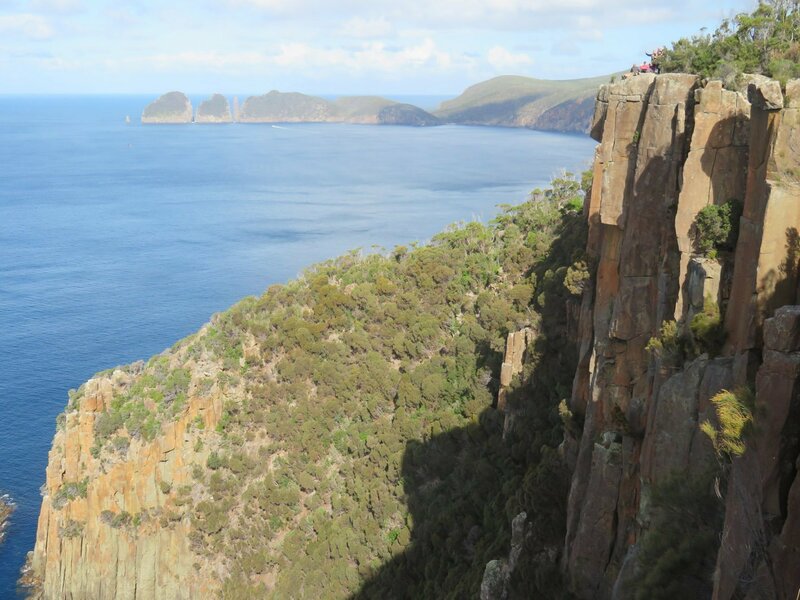 This journey will provide you with exhilarating low level views of the Three Capes and its dolerite organ pipe looking sea stacks, a great way to appreciate the magnitude of the cliffs from the base. With the chance to spot seal, whales and even dolphins. Be met at the boat after your cruise with your takeaway lunch from the Lavendar Farm and the whole group will drive to the start of our last walk to Cape Hauy. 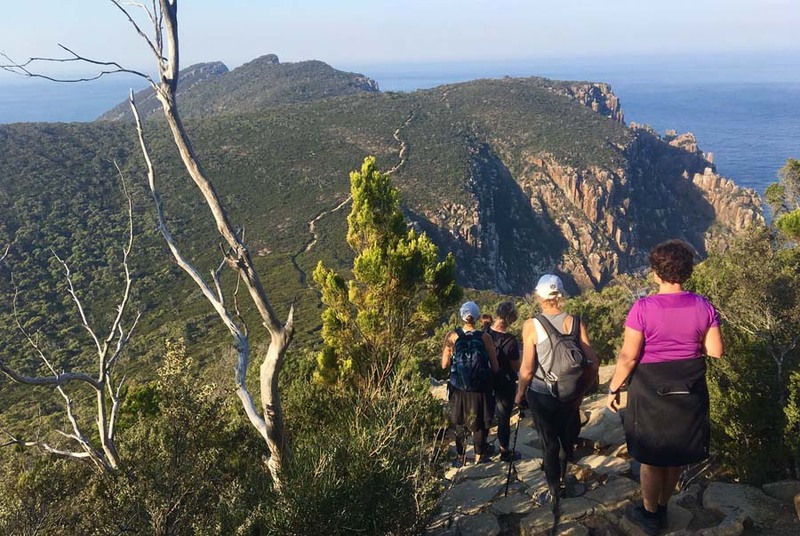 We walk through forest and coastal heath to Cape Hauy, where we will view spectacular off-shore sea stacks known as Totem Pole, The Candlestick and The Lanterns. The peninsula’s bird life is rich and varied with over half of Tasmania’s bird species found on the peninsula. Thre are many steps on this walk, however even if you only walk as far as the lookout the views are just as spectacular. After our walk we make the return journey to Hobart arriving at 7.45pm. Airport drops at 7.30pm are also available enroute into Hobart for those wishing to fly out that night. The end of a fabulous journey. Check out more history of the Three Capes Track. Jef and Scott were great guides on the 3 Capes walk. They are both personable, professional, know their stuff and made sure all group members got the best from the 3 days. Thanks also to Jef for his foot blister prevention management. Stewart Bay Lodge is in a beautiful location and the chalets had every amenity. My bed was super comfortable and I slept like a log. Our cruise was more than great. After seeing amazing sea cliffs, magical caves, friendly seals and soaring albatross we were treated to finding ourselves in the middle of a huge pod of dolphins and their young. They came alongside the boat almost appearing to 'show off' their babies. The experience was enhanced even further by huge Shy and Buller's Albatrosses flying around us. It is an experience I will never forget. The trip more than met my expectations - the walks were varied and at many points quite spectacular and provided plenty of challenge without being exhausting. 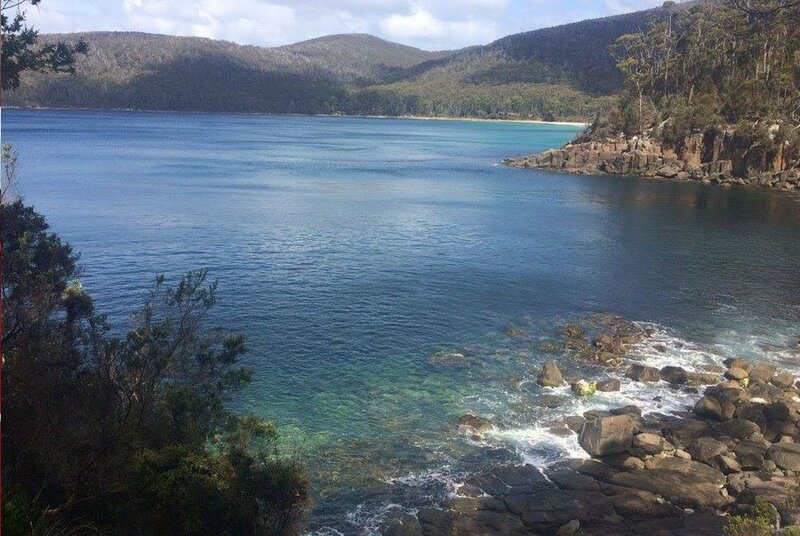 Day 2 was the walking highlight for me, and the swim at the end of the day at Fortescue Bay was magnificent. The cruise on Day 3 was a perfect ending to three terrific days. Thanks again Life's An Adventure. I chose this experience as not needing to carry a large pack. It was excellent. Guides Scott and Daniel were great guides - as good as Guide Barry whose joke telling remains legendary. Lovely to have a Hobartian guide too who was quite quirky and willing to go the extra mile to make our holiday easy and memorable. Dinner was excellent. No trouble with gluten free options. Lunch also very good. Stewart Bay Lodge accomodation, location and setting excellent. Walks exellent, I was looking for the fairies to come out ,of the rainforest on day 2. Truly magical and all days had such stunning views. Both Georgina and Glen were delightful. Relaxed, confident and respectful, quietly keeping as all safe and skillfully handling the group as a group and as individuals. Georgina an expert in Tasmanian Devils and highly knowledgable from Tassie history including Aboriginal history, flora, fauna and local environment. Glen had the logistics role was very well prepared all round as well as knowledgeable, helpul and well travelled. Food was excellent, Plenty of it which was important. Fresh and varied. Stewart Bay Lodge excellent. No need to change any thing about this tour works well. Guide Danny did everything he could to ensure we enjoyed our walks. He informed us about the history, legends, geology, flora and fauna. He carried hot water to serve us with tea and coffee. He was always upbeat and friendly. An excellent guide. Nathan was equally great. He devised an alternative walk for those of us who had problems with knees or ankles so that we had a range of shorter walks and still enjoyed beautiful scenery. He informed us about flora and geology. Always happy and considerate, he was an excellent guide. Stewart Bay was excellent. Nicely appointed chalet. Appreciated the spa bath. Wilderness cruise was a wonderful experience which provided a perfect culmination to our walk. Guide, food, and accommodation all excellent. Wilderness cruise on day 3 was fantastic -This is a world class tour. Overall impress of the tour - above expectations. "What better way to celebrate my 40th birthday than hiking Life's An Adventure Three Capes experience with my best friends from Hong Kong, Shanghai, Brisbane and Sydney. We have had the best time in Tasmania, our guides Jeff and Joel looked after us like royalty and were bursting with interesting facts about the beautiful Tasmanian environment, wildlife and history. We saw three Orcas, bottlenose dolphins, echidnas, a wombat, fur seals and an eagle. We have laughed, shared, bonded, tortured our guides singing Adele and really enjoyed being in each other's company. These are the strongest most determined women and I feel so humbled and blessed that they all made such a huge effort to be with me. Thank you to Life's an Adventure and my amazing friends for one of the best weeks of my life I will treasure every minute and smile thinking of you all"
We spend two nights at Stewart Bay Lodge. From here you will be transferred to the trails each day. The main building of Stewart Bay Lodge on the waterfront, houses a lovely restaurant and lounge and bar area, where you relax and enjoy pre-dinner drinks (own expense). All the chalets at Stewart Bay Lodge are two bedroom chalets and feature a lounge, kitchen and laundry facilites. • The main bedroom has a large king bed (that doesn not split into two singles) and ensuite. • The second room is smaller and has two twin beds or can be set up with a king bed. This room has a bathroom next to the bedroom’s entrance which is for the sole use of the occupants of this room. Guests have the option to upgrade to a One bedroom waterview chalet. Which allows you to have the chalet to yourselves. (i.e. They will lock off the second bedroom- so it is not used). This upgrade is based on two people sharing the chalet. Upgrade cost based on 2 people twin share add $298 extra. Singles have the option to pay a single supplement to have their own bedroom in the two bedroom chalet. Note this means you will still share the chalet, but have your own room. Add $258 extra. Enjoy two course a la carte dinners at our two special restaurans. Below you will find typical menus provided by the restaurants we dine in on tour. All dinners are accompanied by fine Tasmanian wine. Menus are subject to seasonal changes by the chef. Special dietary requirements can be catered for. Earlybirds Save $200 per person when you book and pay in full on any departure from September 2019 to May 2020. Life’s An Adventure Past Passenger save $300 per person. Hurry Earlybirds end 31 May 2019. Earlybirds until 31 May 2019. Save up to $300 per person. Upgrade to a one bedroom deluxe spa chalet with Waterviews. Based on 2 people twin share Add $298.